The ebony-related curly mutation is a relatively new chinchilla mutation. In December of 2007, Chinchillas.com, Jim Ritterspach of Ohio, and Tamara Tucker of Texas collectively imported a small group of curly chinchillas into the United States from Germany. Two of the original curlys stayed in Ohio to join the Ritterspach herd, and three went to Texas to join the Tucker herd. Both breeders initially outcrossed the curlys to expand the relatively small gene pool. Early work with the curly mutation has shown that curls in the phenotype can occur in the first generation, as a result of breeding a non-curly to a curly. Additonally, breeding curly to curly can result in even curlier fur in subsequent generations. This particular curly gene has also proven to be ebony-linked. A chinchilla must express ebony in phenotype in order to also express actual curls in the phenotype. The curly fur can appear in the phenotype of ebony hybrids as well, including tans, and ebony and white mosaics. Theoretically, a wrap-around violet curly could exist, as could a solid sapphire curly, or a tan and white mosaic curly, although the latter have not yet been produced in US herds. Ms. Tucker has also begun work with an Angora/curly hybrid, and the results should prove to be exciting among hobbyist and show breeders worldwide. During a worldwide chinchilla naming contest held from October-December 2010, the curly chinchilla was named 'Locken,' a name selected in part for its compatability with the German name for the same mutation. 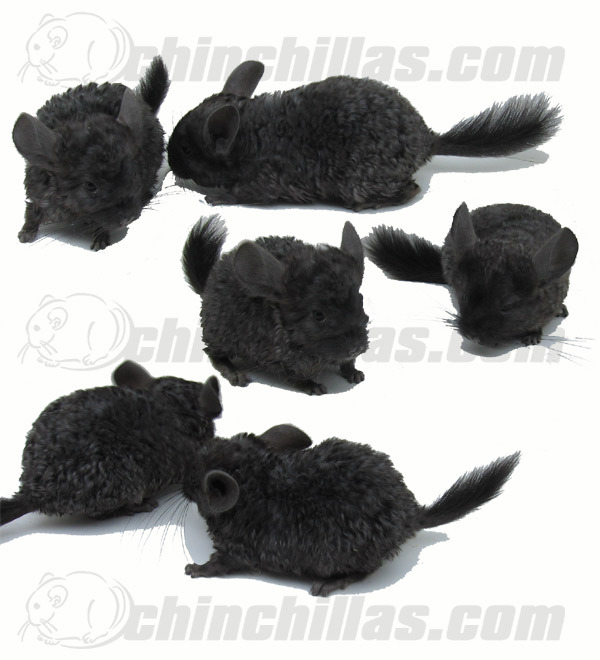 Beginning this same year, a small number of Locken (or curly) chinchillas will offered for sale on Chinchillas.com. Contact sales@chinchillas.com for more information about the Locken chinchillas. Copyright © Chinchillas.com All rights reserved. Designated trademarks and brands are the property of their respective owners.